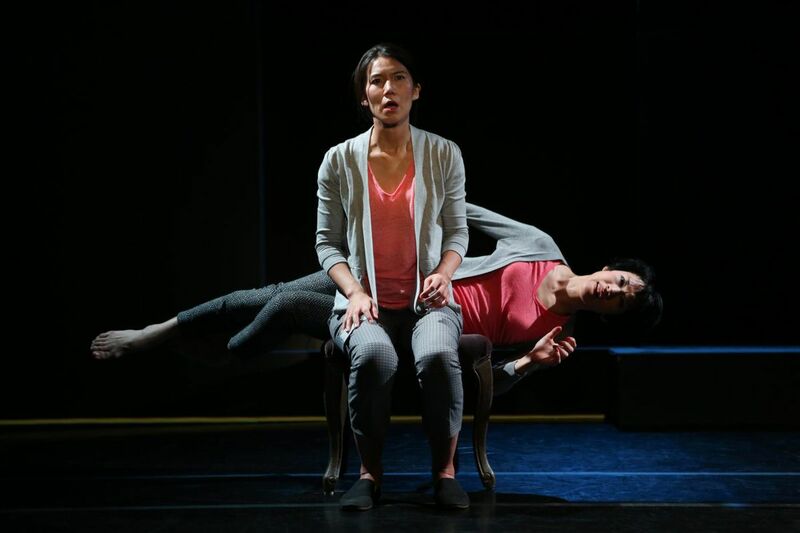 Jiehae Park and Saori Tsukada play alter-egos in “Sleep,” Ripe Time theater company’s adaptation of a Haruki Murakami short story. BROOKLYN — The floor beneath the heroine is breaking apart. But it's not an earthquake. It's her hold on reality, to which she clings — even as the audience isn't sure whether she's dreaming, dead, or hallucinating after 17 days straight without sleep. "All the memories I have from the time before I stopped sleeping seem to be moving away with accelerating speed," says the woman. "As if the me who used to go to sleep every night is not the real me." It's the magic-realist world of Haruki Murakami's short story "Sleep," which, in Naomi Iizuka's stage adaptation, envelops theater audiences Oct. 27 and 28 at the Annenberg Center and which doesn't deliver any typical answers to plot questions. Neither does director Rachel Dickstein, whose New York theater company Ripe Time is bringing Murakami — the idolized 68-year-old Japanese author of 1Q84 and Killing Commendatore — to the stage. "The pleasure of the story is that you don't know," Dickstein said. "Like no other writer, Murakami straddles what's real and what's surreal, the everyday and the extraordinary, the beauty and the terror." "A trap door has opened up into another life, a world that's parallel to her external life," Iizuka says. "Both realities are real. They spill over and bleed into one another. I feel a little bit like a detective, discovering how something happened." The story's housewife/protagonist is visited during the night by a specter who washes her feet and suddenly liberates her from any need to sleep. Night after night, she's awake, reading books, eating chocolate, and seeing how different the world looks, starting with her husband, a dentist who notices no change in his wife. "I said nothing about my trance or my night without sleep," says the woman in the original Murakami story. "What good would it have done?" The play could easily have been a monologue, which is what the Murakami story is. Instead, Sleep is 70 minutes of near-constant video projected into the onstage cube that is the show's circumscribed world. Some 130 sound cues employ an array of 100 or so musical instruments that subtly control the auditory environment. As the story slips into an alternate existence, the actors move in a choreography with ever-so-slightly abstracted normality. Reality is adjusted as a composer would revise a musical score: "Her husband acts like he's doing everyday tasks … but the pace and rhythm changes," says Dickstein. "That's how we tell the story of the woman's changing perspective. We see the world around her change." Even the dinner table slowly seems to roll over on its side — in a change of perspective that's the theatrical equivalent of a cinematic overhead shot. Dickstein sees latter-day parallels with Ibsen's story of domestic liberation in A Doll's House. "You have a path that you set for yourself that the world expects from you, but there's an airlessness around it that's not allowing you to become who you want to become," she says. "This woman has slammed the door on her life and says she doesn't have to play by the rules anymore … but she's in a minefield." Even the mines are enigmatic: The story ends with the woman in a car that's about to be overturned by shadow figures. This isn't a spoiler, because there's no consensus interpretation of what the ending means. "My mind was deep in concentration and expanding," the woman says. "If I wanted, I could have seen into the uttermost depths of the universe. But I decided not to look. It was too soon for that." The production goes on to the prestigious Next Wave Festival at the Brooklyn Academy of Music Nov. 29 to Dec. 2. But the Annenberg stop — specifically the performing art center's more intimate Harold Prince Theatre — is crucial, with eight days of technical rehearsals. Nothing close to that would be possible amid the Brooklyn Academy's festival schedule. "This is something that Annenberg can do well," said Chris Gruits, executive and artistic director of the center. "It's a very detailed production. … It's creating a world within a world." Part of the deal at Annenberg is that theater students at the University of Pennsylvania get to observe the production's final launch from the inside out. The one thing missing has been input from Murakami himself, who lives quietly in Japan, and who approved the adaptation but hasn't had any more than the most indirect interaction with Dickstein and company. Obviously, he isn't likely to see their work. But if Dickstein could ask Murakami anything, what would it be? The question seems overwhelming with possibilities. "What do you dream about?" Dickstein said after a long pause. "I love his mind and imagination, and I would like to ask something that would help me get inside of it and see the way he sees the world." Who knows what she would find? At the end of the story, the woman says, "My mind is crammed full of thick darkness. It's not taking me anywhere." Performances are 8 p.m. Friday and 2 and 7:30 p.m. Saturday at the Annenberg Center for the Performing Arts, 3680 Walnut St.